(Bloomberg) -- With Vladimir Putin now in his last consecutive presidential term, post-communist Russia’s first generation of billionaires is starting to test his commitment to private property by giving parts of their wealth to heirs. 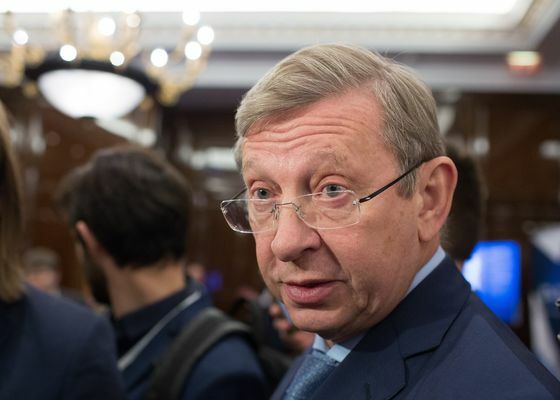 One of Russia’s oldest tycoons, Vladimir Evtushenkov, 70, led off last summer, ceding a stake in the AFK Sistema conglomerate to his son Felix shortly after Putin was sworn in. Lukoil PJSC co-founder Leonid Fedun followed, granting a total of $1.3 billion of the energy giant’s stock to his son and daughter in October, just before Evtushenkov doubled Felix’s holding to 5 percent. Unique among the biggest economies, Russia last saw major fortunes change hands via inheritance more than a century ago, before the Bolsheviks seized power, according to the Skolkovo Wealth Transformation Center in Moscow. While most restrictions on free enterprise ended along with the Soviet Union, the unwritten rule book for amassing and transferring capital that’s developed under Putin remains a hurdle to the reemergence of dynastic wealth. “It rests on the informal contacts of fathers, which are difficult, if not impossible, to transfer to children,” said Alena Ledeneva, a professor of politics and society at University College London. Ledeneva, who’s studied and written about Russian power networks for two decades, calls the informal relationships that govern both state and corporate structures simply “Sistema”, or “The System”—the same name Evtushenkov chose for his holding company. Unlike the West, where independent judiciaries have long had the final say in matters of ownership, in Russia the ultimate arbiter is the Kremlin and the legions of bureaucrats and law-enforcement personnel it commands. Safeguarding wealth often hinges on personal ties and tacit agreements with officials that can touch on everything from taxes and favors to civic responsibility and patriotic duty. For Evtushenkov, who’s widely lauded by peers for his ability to succeed in multiple industries, navigating the nexus of power and money is so nuanced that he worries Felix, 40, may find it difficult to maintain, let alone grow, the investments he oversees as Sistema’s deputy chairman. It’s an issue confronting an unprecedented number of billionaires and multimillionaires worldwide as the current cohort of self-made titans ages along with those lucky enough to inherit riches. UBS Group AG estimates that $3.4 trillion of private assets will be passed on globally over the next two decades. 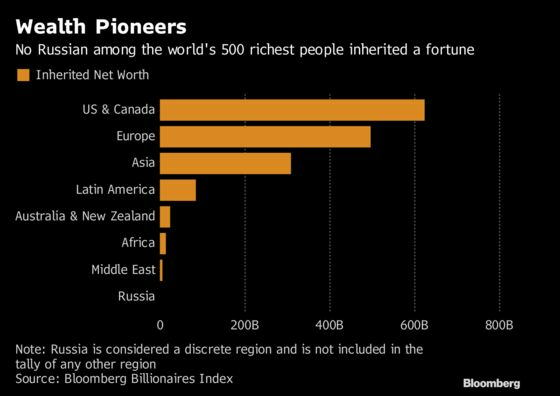 Of the world’s 500 richest people, 178 received the bulk of their fortune from relatives, including two from China, according to the Bloomberg Billionaire’s Index. They include seven Waltons with a combined worth of more than $150 billion, the Duke of Westminster, who inherited land that’s been in his family since 1677, and L’Oreal SA’s Francoise Bettencourt Meyers, the world’s wealthiest woman. In Russia, some 189,500 people worth $1 million or more collectively control about $1.1 trillion of assets, Capgemini estimates. Surveys show that as many as 70 percent of these people consider “wealth succession” among the biggest problems they’ll face over the next 10 years, data compiled by Knight Frank show. Evtushenkov’s on-the-record comments about his own succession plans are rare for a mogul in Moscow, where commercial and personal secrecy is prized. Just as unusual, given his past run-ins with authorities, is where he was when he made them—inside the Kremlin Concert Hall, at an event attended by Putin. Back in 2014, Evtushenkov was placed under house arrest and shackled with a tracking anklet after investigators accused him of money laundering and other alleged crimes connected to Sistema’s acquisition of Bashneft, an oil company that formed the bulk of what was then a $7 billion fortune. Local media were quick to predict his doom, drawing parallels to the prosecution of Mikhail Khodorkovsky, then Russia’s richest man, a decade earlier. But those were different times. Evtushenkov’s legal odyssey began just as Western sanctions over the Ukraine crisis were beginning to bite and the Kremlin was determined to maintain unity among the elite. Within three months, the Sistema chief was cleared of all charges, but only after Bashneft—and most of his wealth—was nationalized. Four years later, right before the New Year, he was happily sharing a room with Putin, 66, during an awards ceremony for the Russian Geographic Society, an organization that he sponsors and is dear to the president’s heart. Undeterred by having his fortune slashed to $1.8 billion, the serial investor is showing no signs of slowing down. A former engineer, he set up Sistema with partners after communism collapsed to trade oil and dabble in construction. He then started what became Russia’s largest cellular operator before branching out to banking, media and even retail. Now he’s moving into e-commerce and agriculture. Many Russian tycoons don’t want their kids to follow in their footsteps, with some even hiding the true extent of their holdings. One respondent to an anonymous questionnaire that Skolkovo sent to children of the ultra rich said he had no idea his father was a billionaire until he happened to see a magazine article that identified him as one. Other magnates are supporting their kids’ business aspirations in different ways. A son of Roman Abramovich, a longtime Putin ally, is overseeing a project to invest as much as $750 million in greenhouse projects in Russia’s Far East. Abramovich’s partner in steelmaker Evraz Plc, Alexander Frolov, is an investor in Alexander Jr.’s Target Global fund, which has 700 million euros ($800 million) under management. There are also practical reasons for so-called oligarchs to involve their children in business. Suleyman Kerimov, for example, ceded his controlling stake in Polyus PJSC, Russia’s largest gold miner, to his 23-year-old son Said, allowing the elder Kerimov to keep his seat in the upper house of parliament. The financial elite are closely watching what happens with these interfamilial transactions, particularly at Sistema and, more strategically, Fedun’s Lukoil, which pumps about 2 percent of the world’s oil and operates across the globe, often in coordination with the state. Fedun declined to comment on what role, if any, he sees his children having at Lukoil now that they own a combined 2.3 percent of the company. Fedun’s older and richer partner, Vagit Alekperov, 68, has given his son about $76 million of stock, though he’s ruled out ever asking him to do the kinds of things he’s required to do as chairman and CEO of one of the biggest taxpayers and employers in the country. The lifelong oilman told Bloomberg Television in 2017 that he planned to continue running Lukoil for another three to five years—the amount of time he predicted it would take to find and groom a successor.